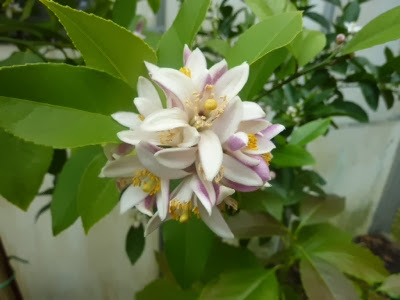 My Home and Garden: Meyer Lemon flowers!! 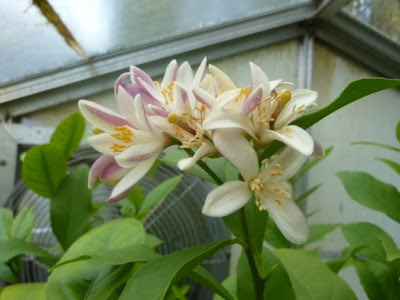 Since moving the lemon and lime into the greenhouse, they have exploded into flower. That is the lime behind the lemon and the Avocado below it. It smells amazing in there. However, the bees are gone so I have to hand pollinate. I love pollinating but that end of the greenhouse is a titch crowded with trees so it's hard to reach the back. It is so satisfying being a part of nature and creating fruit!! And it's local. Now....I wonder if there's any chance that avocado with ever bear fruit? Considering I thought I was going to lose this tree this summer, it is amazing to see this. lovely! keep us updated on the fruit watch!